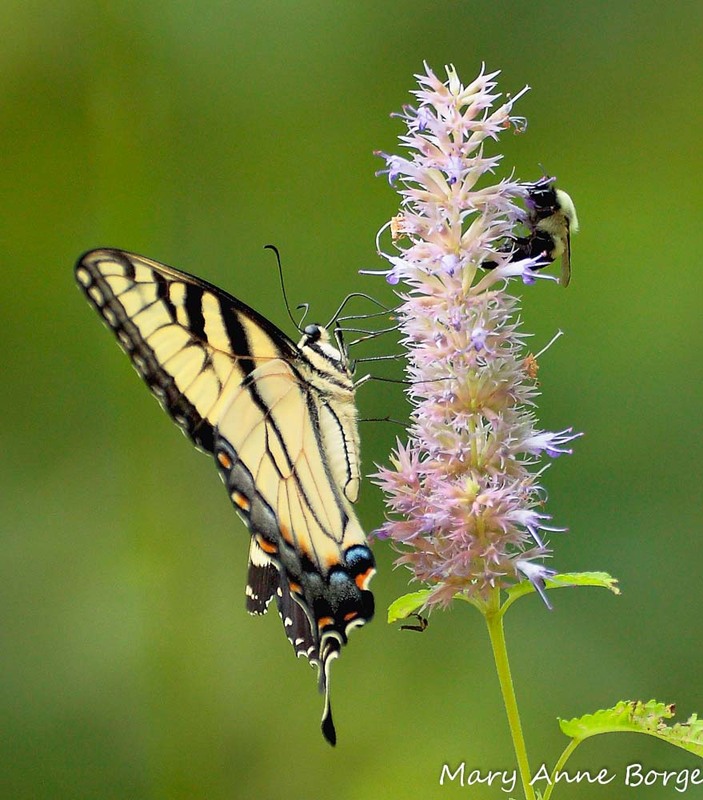 Pictured here are an Eastern Tiger Swallowtail and a Bumble Bee, dining together amicably at Purple Giant Hyssop (Agastache scrophulariifolia) flowers. This graceful plant is quite an attraction to butterflies and other beneficial pollinators, including many species of bees. They may be seen on a single flower spike drinking contentedly. Ruby-throated Hummingbirds may also sip nectar from the tiny purple tubular flowers. Although the individual flowers are tiny, they can still accommodate this thirsty, industrious little bird. Generally blooming from late July or early August through September, like so many other plants this year Purple Giant Hyssop started blooming many weeks earlier than normal, encouraged by the unusually warm temperatures. It started blooming in June, and shows no sign of stopping. Reaching to a height of two to four feet, Purple Giant Hyssop can tolerate part shade to full sun, and prefers a moist soil. Characteristic of the mint family, this plant has a square stem, and opposite leaves that are fragrant when crushed. Tiny flowers mass in showy spikes five to six inches long, adorning the candelabra-like plant. As with other mint family members, blooming takes place out over a long period, since the individual flowers on each spike don’t all open at once. The flowers open gradually over a period of several weeks, maximizing the plant’s chances of successful pollination, with the assistance of its insect partners. This long bloom period is good for the pollinators, too, since it offers a continuing supply of food. Individual flowers on the spike open to a tasteful shade of purple when in bloom, and provide a softer background color when the flower is spent. If the dry flower spikes are left standing in the garden after the bloom period is finished, you may find that you have an unexpected bonus: a source of food for birds. Local Chickadees and Goldfinches may seek out the seeds that result from flowers pollinated by the summer visits of butterflies and bees. Left in the garden, the flower heads will last through the winter, retaining their shape and form. Purple Giant Hyssop will readily reproduce from seed, so if you prefer that it not spread, deadhead the spent flowers before they produce and release their seeds. If pale yellow is more your color, there is a close relative, Yellow Giant Hyssop (Agastache nepetoides), with similar characteristics, but pale yellow flowers. Both Purple and Yellow Giant Hyssop are rated as imperiled species in New Jersey because of their rarity, primarily due to habitat destruction. Purple Giant Hyssop is easy to grow, and those fragrant leaves make it deer resistant. It is native in the eastern United States from New Hampshire to Georgia, and as far north and west as Ontario province, Minnesota and North Dakota, and south to Kansas, so it has adapted to the growing conditions in this broad area. Include this plant in your garden, and enjoy the butterflies, birds and bees that visit. This entry was posted in Birds, Butterflies, Gardening for Wildlife, Native Plants, Other Insects and Spiders and tagged Agastache nepetoides, Agastache scrophulariifolia, Eastern Tiger Swallowtail, nature, Purple Giant Hyssop, Yellow Giant Hyssop by Mary Anne Borge. Bookmark the permalink. Just found you…looking for Pipevine Swallowtails. Thanks. I’m glad you found The Natural Web! Have one in my yard. Don’t think I planted it in an optimum spot. Gets flowers and bees but haven’t seen any seedlings. It does come back every year though. In my garden, it seems to take two years or more for a seedling to mature to the flowering stage.